JUST $780.00! Out of stock. Email me when new stock arrives. Vanishing Inc. has been selected as an official partner of FISM 2015 and we are happy to be able to offer convention tickets directly to our customers, for your convenience. The FISM World Championship (held 6 - 11 July 2015), is the Olympic Games of Illusionism. 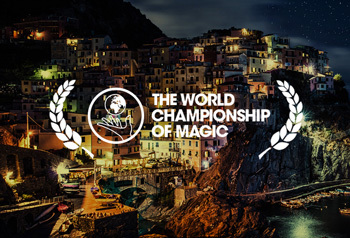 This year, Masters of Magic (headed by Walter Rolfo) have been selected to organize the convention. We have seen their plans firsthand and believe that this will be the best FISM ever! The convention will be held in Remini, Italy within the brand new Pala Congressi; one of the largest, innovative, and most versatile conference centers in Europe. The line up, as always, is absolutely stellar. But the reason that we (Andi and Josh) love FISM is not the lectures, but the competitions. This is an opportunity to see the best in the business strut their stuff in front of three or four thousand peers. It's a unparalleled experience! By purchasing your ticket through Vanishing Inc. you get exactly the same registration and benefits as registering direct, but with the ease of dealing directly with Vanishing Inc.'s top class customer service team! Price includes registration only; you will need to organise your own hotel and travel. We'll be there and we hope you'll come with us. Josh and Andi plan to host an informal get together for everyone that registers directly with Vanishing Inc.